The mission of Innovus is to make Stellenbosch University innovation matter. We strive to maximize Stellenbosch University’s impact on the South African society by using the output of the University's research to promote entrepreneurship, creating new jobs and new products and services that address the needs of all of South Africa’s citizens. Innovus also strives to support the University in optimising 5th stream income. 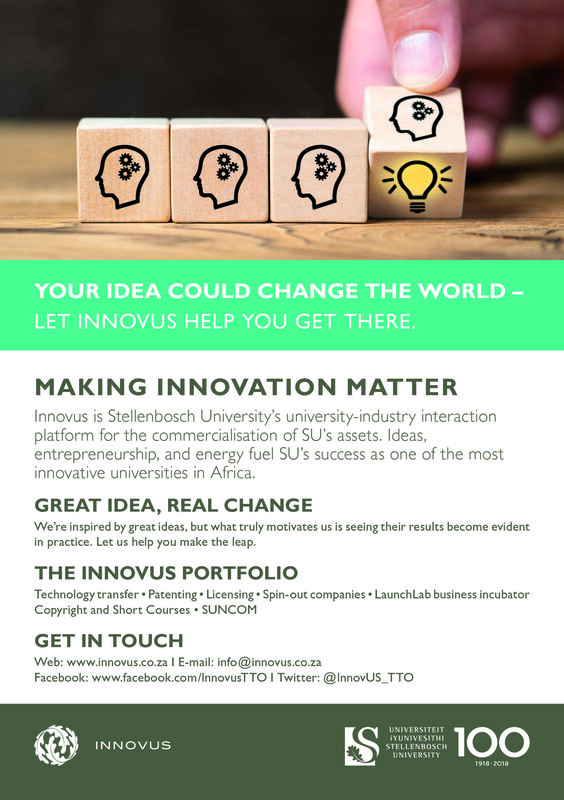 Innovus is the university industry interaction and innovation company of Stellenbosch University. Innovus is responsible for technology transfer, entrepreneurial support and development, and innovation at the university. We manage the commercialisation of the University’s innovation and intellectual property portfolio through patenting, licensing and the formation of spin-out companies. Through our LaunchLab business incubator, we offer various services to and opportunities for entrepreneurs. In addition to this our equity holding in the Innovus group of companies is a valuable asset for the university. The University’s Short Courses and Copyright division as well as Commercial Services also falls under Innovus. Our website profiles our impressive portfolio of patents and provides tools and advice for inventors wishing to commercialise their ideas, and investors who want to help turn great ideas into reality. Browse our website or click here to contact us with a specific request.